One-story bungalow with front gable roof, German siding, attached front porch with front gable roof. Porch details include replacement iron posts, no balustrade. Rusticated block foundation, six-aver-one windows, interior brick chimney, small level lot. Like 311 Spring Street (#19), this house does not appear in city directories until 1950, but appears to be older. Sanborns date it between 1926 and 1954. 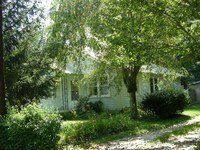 Adger Sexton, a farmer, and wife Catherine lived here beginning in 1950 until at least 1953. Storage building. Non-contributing, ca. 1970s. One-story modern wood frame storage building with front gable roof, vertical board siding. One-story modern wood frame storage building with shallow side gable roof.